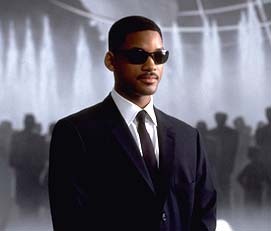 Will Smith is recruited as a law-enforcement officer over inter-galactic aliens. He and his partner, Tommy Lee Jones work undercover to save the earth from destruction when they discover a plot to blow up the Earth. The presence of the aliens on Earth remains secretive and anyone who comes too close to discovering their existence is 'treated' to a temporary memory loss to avoid any panics. Cast Includes: Will Smith, Tommy Lee Jones (Batman Forever, The Fugitive, JFK), Linda Fiorentino (Body Count), Vincent D'Onofrio (JFK, Malcolm X - 1992), Rip Torn, Tony Shalhoub (Addams Family Values), Siobhan Fallon (Forrest Gump), Mike Nussbaum and Richard Hamilton (Mo' Money).